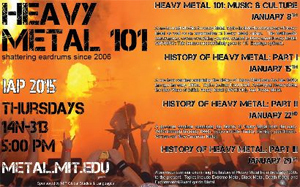 Heavy Metal 101 is celebrating its tenth anniversary at MIT (Massachusetts Institute of Technology) in Cambridge, MA. This crash course in all things heavy metal will have you head banging, air guitaring, and devil horn raising in no time. Learn everything you ever wanted to know about heavy metal, including who’s awesome, who isn’t, why louder does mean better, and so much more! This multimedia extravaganza promises to cover everything you ever wanted to know about heavy metal. A one-hour seminar examining the history of heavy metal from the early 1990s to the present. Topics include extreme metal, black metal, death metal, and experimental / avant-garde metal.